What are the symptoms and signs of cataracts? How do health care professionals diagnose cataracts? What types of doctors perform cataract surgery? What are the different types of cataract surgery? What are the different types of intraocular lenses implanted after cataract surgery? What should one expect prior to and on the day of cataract surgery? What are potential complications and side effects of cataract surgery? What should one expect after the cataract surgery? What is the recovery time after cataract surgery? Andrew A. Dahl, MD, is a board-certified ophthalmologist. Dr. Dahl's educational background includes a BA with Honors and Distinction from Wesleyan University, Middletown, CT, and an MD from Cornell University, where he was selected for Alpha Omega Alpha, the national medical honor society. He had an internal medical internship at the New York Hospital/Cornell Medical Center. 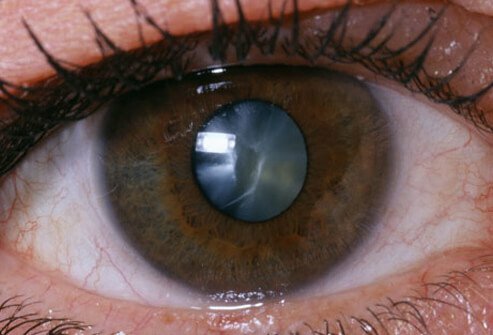 Quiz: Could it Be Cataracts? Early symptoms of cataracts include blurred vision, glare, and difficulty reading. Cataracts will affect most people and become more prominent as we age. Cataracts can be diagnosed when the doctor examines the eyes with specialized viewing instruments. The decision to proceed with cataract surgery is primarily based on the amount of difficulty you have performing your routine daily activities. Treatment for cataracts is surgical removal of the cataract with implantation of an artificial lens. There are a variety of intraocular lens types that can restore vision in different ways. Cataract surgery is a safe and effective way to restore vision with serious complications being unusual. A cataract is an eye disease in which the normally clear lens of the eye becomes cloudy or opaque, causing a decrease in vision. The natural lens of the eye focuses light onto the back of the eye (the retina) so images appear clear and without distortion. The clouding of this lens during cataract formation causes blurring and distortion of vision. Cataracts are usually a very gradual process of normal aging but can occasionally develop rapidly. They commonly affect both eyes, but it is not uncommon for a cataract in one eye to advance more rapidly. Cataracts are very common, especially among the elderly. Precisely why cataracts occur is unknown. However, most cataracts appear to be caused by changes in the protein structures within the natural lens that occur over many years and cause the lens to become cloudy. Rarely, cataracts can present at birth or in early childhood as a result of hereditary enzyme defects, other genetic disease, or systemic congenital infections. Severe trauma to the eye, eye surgery, or intraocular inflammation can also cause cataracts to develop more rapidly. Other factors that may lead to development of cataracts at an earlier age include excessive ultraviolet light exposure, exposure to ionizing radiation, diabetes, smoking, or the use of certain medications, such as oral, topical, or inhaled steroids. Other medications that may be associated with cataracts include the long-term use of statins and phenothiazines. The total number of people who have cataracts in the United States is estimated to increase to 30 million by 2020. When people develop cataracts, they begin to have difficulty doing activities they enjoy. Some of the most common complaints include difficulty driving at night, reading, watching television or movies, and recognizing faces. These are all activities for which clear vision is essential. Many cataracts are not bothersome, causing few symptoms. In that situation, no surgical treatment is necessary. However, the only true treatment for cataract is surgical removal of the cloudy lens. Surgery is suggested if the patient loses the ability to perform necessary activities of everyday life, such as driving, reading, or looking at computer or video screens, even with glasses, and there is the expectation that vision will improve as a result of the surgery. The vision when one has a cataract is similar looking through a dirty windshield of a car or smearing grease over the lens of a camera or your glasses. Cataracts may cause a variety of complaints and visual changes, including blurred vision, difficulty with glare (often with bright sun or automobile headlights while driving at night), dull color vision, increased nearsightedness accompanied by frequent changes in eyeglass prescription, and occasionally, double vision in one eye. A change in glasses may initially help once vision begins to change from a cataract. However, as the cataract continues to become denser, vision also becomes cloudier, and stronger glasses or contact lenses will no longer improve sight. Some people with cataracts may experience symptoms of vision problems with only a mild cataract in one eye, while others may not notice any visual abnormalities until both eyes develops significant cataracts. Cataracts typically develop gradually and are usually not painful or associated with any eye redness or other symptoms unless they become extremely advanced. Rapid and/or painful changes in vision raise suspicion for other eye diseases and should be evaluated by an eye-care professional. Cataracts are detected by finding lens cloudiness or opacification during a medical eye examination by an eye-care professional or sometimes by a primary care physician. The abnormal lens can be seen using a variety of specialized viewing instruments. Using various tests, an ophthalmologist (MD, a medical doctor specializing in diseases of the eye) or an optometrist (a doctor of optometry, a health care professional trained in primary care of the eye, not the same as a medical doctor) is able to tell how much a cataract may be affecting vision. Usual eye tests include testing visual acuity, glare sensitivity, color vision, contrast sensitivity, and a thorough examination of all other parts of the eye, making certain that vision loss is not due to other common eye problems, including diabetes, glaucoma, or macular degeneration. Most cataracts associated with aging develop slowly, and many patients may not notice visual loss until it is fairly advanced. It is not imperative to have surgery to remove a cataract until it begins to affect vision. The development of cataracts is unpredictable; some cataracts remain less dense and never progress to the point where they cause cloudy vision and require treatment, while others progress more quickly. Thus, the decision and timing to proceed with cataract surgery is individualized for each patient. Your doctor will be able to tell you how much of your vision loss is due to cataracts and the quantity of recovery of vision that may be expected with surgery. If your visual loss is solely due to the presence of a cataract, vision should be fully restored with successful cataract surgery. An ophthalmologist is a medical doctor who has specialized in the diagnosis and medical and surgical treatment of eye diseases. An ophthalmologist has the knowledge and training to diagnose a cataract, help you make a decision regarding the need for surgery, and can perform the surgery, including preoperative and postoperative care. Eye care professionals may mention during a routine eye exam that you have early cataract development even if you are not yet experiencing visual symptoms. Although your doctor will be able to tell when you first begin to develop cataracts, you will generally be the first person to notice changes in your vision that may require cataract surgery. Clouding of the lens may start to be seen at any age, but it is uncommon before the age of 40. However, a large majority of people will not begin to have symptoms from their cataracts until many years after they begin to develop. Cataracts can be safely observed without treatment until you notice changes in your vision. Surgery is recommended for most individuals who have significant vision loss and are symptomatic secondary to cataract. If you have significant other eye disease unrelated to cataracts that limits your vision, your ophthalmologist may not recommend surgery. Sometimes a cataract may make it difficult for your eye-care professional to clearly see the retina at the back of the eye. In these cases, it may be appropriate to remove the cataract so that retinal or optic nerve evaluation and treatment can occur. The mode of surgery can be tailored to individuals based on coexisting medical problems. Cataract surgery is generally performed with minimal sedation and typically takes less than 30 minutes. Therefore, the surgery does not put significant strain on the heart or the lungs. Prior refractive surgery such as LASIK is not a contraindication to cataract surgery. It is reasonable to have cataract surgery in only one eye. A cataract is a medical condition, and insurance companies usually cover part or all of the cost of cataract surgery, including pre- and postoperative care. Ask your physician any questions you may have about the cost involved. The standard cataract surgical procedure is performed in a hospital or in an outpatient surgery center. There is no overnight stay at the facility. The most common form of cataract surgery today involves a process called phacoemulsification. After numbing the eye with drops or an injection, your surgeon, with the use of an operating microscope, will make a very small incision in the surface of the eye in or near the cornea. A thin ultrasound probe, which is often confused with a laser by patients, is inserted into the eye and uses high-ultrasonic vibrations to break up (phacoemulsify) the clouded lens. These tiny fragmented pieces are then suctioned out of the eye using the same ultrasound probe. Once the cataract is removed, an artificial lens is placed into the thin capsular bag that the cataract previously occupied. This lens is essential to help your eye focus after surgery. Phacoemulsification: This is the most common form of cataract removal as explained above. In this most modern method, cataract surgery can usually be performed in less than 30 minutes and usually requires only minimal sedation. Numbing eyedrops or an injection around the eye is used and, in general, no stitches are used to close the wound, and often no eye patch is required after surgery. Although phacoemulsification itself is not performed using a laser, a femtosecond laser may be used to make an opening in the anterior capsule of the lens immediately prior to the emulsification of the lens. Extracapsular cataract surgery: This procedure is used mainly for very advanced cataracts in which the lens is too dense to dissolve into fragments (phacoemulsify) or when phacoemulsification is impossible. This technique requires a larger incision so that the cataract can be removed in one piece without being fragmented inside the eye. An artificial lens is placed in the same capsular bag as with the phacoemulsification technique. This surgical technique requires a various number of sutures to close the larger wound, and visual recovery is often slower. Extracapsular cataract extraction usually requires an injection of numbing medication around the eye and an eye patch after surgery. Intracapsular cataract surgery: This surgical technique requires an even larger wound than extracapsular surgery, and the surgeon removes the entire lens together with the surrounding capsule. This technique requires the intraocular lens to be placed in a different location, in front of the iris. This method is rarely used today but may still be useful in certain situations. As the natural lens plays a vital role in focusing light for clear vision, artificial lens implantation at the time of cataract surgery is necessary as a replacement for the natural lens to yield the best visual results. Because the lens implant is placed in or near the original position of the removed natural lens, vision is restored, and peripheral vision, depth perception, and image size are not negatively impacted. Artificial lenses usually remain permanently in place, require no maintenance or handling, and are neither felt by the patient nor noticed by others. There are a variety of intraocular lens styles available for implantation, including monofocal, toric, and multifocal intraocular lenses. The latter include accommodative lenses such as the Crystalens. Monofocal lens: These lenses are the most commonly implanted lenses today. They have equal power in all regions of the lens and can provide high-quality distance vision, usually with only a light pair of spectacles necessary for near vision. Monofocal lenses are in sharpest focus at only one distance. They do not correct preexisting astigmatism, a result of irregular corneal shape that can distort vision at all distances. Your surgeon may correct the astigmatism at the time of cataract surgery by making one or two additional incisions in the periphery of the cornea. This does not make the surgery more dangerous. People with significant astigmatism require corrective lenses for sharpest vision at all distances. Patients who have had monofocal intraocular lenses implanted usually require reading glasses. Toric lens: Toric lenses have more power in one specific axis in the lens to correct astigmatism as well as distance vision. Due to the difference in lens power in different areas, the correction of astigmatism with a toric lens requires that the lens be positioned in a very specific configuration. While toric lenses can improve distance vision and astigmatism, the patient still will require corrective lenses for all near tasks, such as reading or writing. Multifocal lens: Multifocal intraocular lenses are one of the latest advancements in lens technology. These lenses have a variety of regions with different power that allows some individuals to see at a variety of distances, including distance, intermediate, and near. While promising, multifocal lenses are not for everyone. They can cause significantly more glare and loss of contrasts than monofocal or toric lenses. Multifocal lenses cannot correct astigmatism, and some patients still require spectacles or contact lenses for clearest vision. Prior to the day of surgery, your ophthalmologist will discuss the steps that will occur during surgery. Your ophthalmologist or a staff member will ask you a variety of questions about your medical history and perform a brief physical exam. You should discuss with your ophthalmologist which, if any, of your routine medications you should avoid prior to surgery. Well prior to surgery, several calculations will be made to determine the appropriate power of intraocular lens to implant. A specific artificial lens is chosen based on the length of the eye and the curvature of the cornea (the clear portion of the front of the eye). The lens power of a monofocal intraocular lens can be chosen to either give you best distance, intermediate or near vision without glasses. Some people who have been nearsighted (myopic) all of their life might prefer to continue to wear no glasses for reading and wear distance glasses after cataract surgery. It is important to remember to follow all of your preoperative instructions, which will usually include not eating or drinking anything after midnight the day prior to your surgery. As cataract surgery is an outpatient procedure, arrangements should be made with family or friends to transport you home after the surgery is complete. Most cataract surgery occurs in either an ambulatory surgery center or a hospital. You will be required to report several hours before the scheduled time for your surgery. You will meet with the anesthesiologist who will work with the ophthalmologist to determine the type of sedation that will be necessary. Most cataract surgery is done with only minimal sedation without having to put you to sleep. Numbing drops or an injection around the eye will be used to decrease sensation of the eye. During the actual procedure, there will be several people in the operating room in addition to your ophthalmologist. These include an anesthesiologist and operating-room technicians. While cataract surgery does not normally involve a significant amount of pain, medications are used to minimize the amount of discomfort. The actual removal of the clouded lens will take approximately 20 minutes. You may notice the sensation of pressure from the various instruments used during the procedure and will be seeing the light from the operating microscope. After leaving the operating room, you will be brought to a recovery room where your doctor will prescribe several eyedrops that you will need to take for a few weeks postoperatively. While you may notice some discomfort, most patients do not experience significant pain following surgery. If you do experience decreasing vision or significant pain, you should contact your ophthalmologist immediately. While cataract surgery is one of the safest procedures available with a high rate of success, rare complications such as infection (endophthalmitis) or bleeding can arise. Your ophthalmologist will discuss the specific potential complications of the procedures that are unique to your eye prior to having you sign a consent form. The most common difficulties arising after surgery are persistent inflammation, changes in eye pressure (glaucoma), infection, or swelling of the retina at the back of the eye (cystoid macular edema), and retinal detachment. If the delicate bag the lens sits in is injured, then the artificial lens may need to be placed in a different location. In some cases, the intraocular lens moves and may need to be repositioned, exchanged, or removed. All of these complications are rare but can lead to significant visual loss; thus, close follow-up is required after surgery. If you have preexisting macular degeneration, optic nerve damage or floaters, these will not be made better by cataract surgery. Frequently, within months to years after surgery, the thin lens capsule may become cloudy, causing blurred vision after cataract surgery. You may have the sensation that the cataract is returning because your vision is becoming blurry again. This process is termed posterior capsular opacification, or a "secondary cataract." To restore vision, a laser is used in the office to painlessly create a hole in the cloudy bag (posterior capsulotomy). This procedure takes only a few minutes in the office, and vision usually improves immediately. American Academy of Ophthalmology. "Cataract in the Adult Eye PPP -- 2016." October 2016. <https://www.aao.org/preferred-practice-pattern/cataract-in-adult-eye-ppp-2016>. de Vries, N.E., and R.M. Nuijts. "Multifocal intraocular lenses in cataract surgery: literature review of benefits and side effects." J Cataract Refract Surg 39.2 Feb. 2013: 268-278. United States. National Eye Institute. "Facts About Cataract." <https://www.nei.nih.gov/health/cataract/>. Do you know the definition of cataracts? Take the quiz and learn about cataracts surgery, symptoms, signs, treatment, causes, and types. Read more: What Are Cataracts? Please describe your cataract surgery. How has cataract surgery affected your vision? A cataract is an eye disease that causes the eye's lens to become cloudy and opaque with decreased vision. Causes of cataracts include diabetes, hypothyroidism, certain genetic illnesses, hyperparathyroidism, atopic dermatitis, and certain medications. Symptoms and signs include a decrease in vision and a whitish color to the affected eye. Treatment depends upon the patient's specific visual needs and may involve cataract surgery. Cataract is a painless condition where the normally clear aspirin-sized lens of the eye starts to become cloudy. See a picture of Cataracts and learn more about the health topic. Coats' disease is a rare eye condition that typically progresses to vision loss or blindness in one eye. Gradual vision loss is usually the first symptom, followed by a cloudy white or yellow pupil due to the presence of a cataract. Treatment focuses on limiting the blood vessel progression and may involve cryotherapy or laser photocoagulation. Read about symptoms, signs, diagnosis, treatment, and prognosis. Many common eye disorders resolve without treatment and some may be managed with over-the-counter (OTC) products. It's important to visit a physician or ophthalmologist is the problem involves the eyeball itself or the condition hasn't improved after 72 hours of use of an eye-care OTC product. Eye floaters are deposits or condensation that forms in the eye's vitreous humor. These deposits cast shadows on the retina, and as the eye moves, the deposits shift position, making it appear as though the shadows are moving or floating. Midazolam injection, Versed (discontinued brand) is a drug prescribed to use during surgery as a sedation to reduce anxiety, and help patients forget the surgical experience. This medication is also prescribed to administer to patients prior to anesthesia to maintain anesthesia, patients who are intubated for respiration control are given midazolam injection. It is also prescribed for treating seizures. Myopia, or nearsightedness, makes it difficult to focus on objects that are far away. The condition runs in families and occurs because light focuses in front of the retina, instead of directly on it. Headaches, eye strain, and fatigue are symptoms of myopia. The condition is diagnosed by having an eye exam and can be treated by wearing glasses or contact lenses or by having refractive surgery. Retinal detachment is the separation of the retina from its attachments to the underlying eye tissue. Symptoms of retinal detachment include flashing lights and floaters. Highly nearsighted young adults and those who've had cataract surgery are at higher risk for retinal detachment. Retinitis pigmentosa (RP) is a genetic condition that causes retinal degeneration and eventual vision loss. Symptoms include night blindness and tunnel vision. Visual field testing and electrophysiological testing are essential in diagnosing RP. Though there is no cure for RP, vitamin A therapy and an omega-3-rich diet may be recommended for patients to slow disease progression. Smoking is an addiction. More than 430,000 deaths occur each year in the U.S. from smoking related illnesses. Secondhand smoke or "passive smoke" also harm family members, coworkers, and others around smokers. There are a number of techniques available to assist people who want to quit smoking. Serious side effects can occur. Drug interactions, dosing, storage, and pregnancy safety should be reviewed prior to taking this medication.